GORGEOUS MAKEOVER ! R E L A X in this TOTALLY remodeled-buffed out two-level condo next to River Run Ski Lodge. With neutral colors throughout you will enjoy this totally remodeled condo kitchen, and baths, carpets, vaulted ceilings and a wood burning fireplace. This condo is spacious, cozy, and warm. The living room has two sliding glass doors that lead to a large deck to relax, with a gas BBQ. Location: This property is ideal for sports enthusiasts and families who love snow skiing, biking, hiking, swimming and fishing OR for guests who want to walk to town and shop and indulge in our finest restaurants. Ketchum city center is just a few blocks away - exquisite clothiers, five-star restaurants, and a great night life await you. Skiers: Ski to River Run chairlift or walk a thousand feet to enjoy a great hike up Bald Mountain. Sun Valley's 48-mile groomed bike/cross country ski trail is outside your door. * Main floor master bedroom with queen-size bed w/attached full bath with tile counter top. * Upper bedroom consists of two twin beds that can be converted to one king bed with a remodeled 3/4 bath with large glassed shower. * Fully equipped kitchen offers new alder wood and glass door cabinets, mood lighting, and is open to the living room. The kitchen has wood flooring and the living room has new carpeting. Dining table seats six comfortably. * Living room with sofa and two chairs, wood burning cozy fireplace, TV with DVD & VHS; 2 sliding glass doors that lead to the BBQ/viewing deck. Relax, eat and sip. * Outside storage is adjacent to front door for skis, fishing gear, etc. * Summer swimming in quiet secluded pool and fall/winter/spring enjoy the Jacuzzi. Need another unit in the same complex? - We also have a two bedroom/two bath unit VRBO #163595. If you need more space, I also have a three bedroom two bath and three bedroom three bath. E-mail me for more information. 100 yards from the River Run Ski Lift. The unit was perfect for our needs. Close to ski resort, comfortable beds, well stocked kitchen. The property was just what we were looking for. 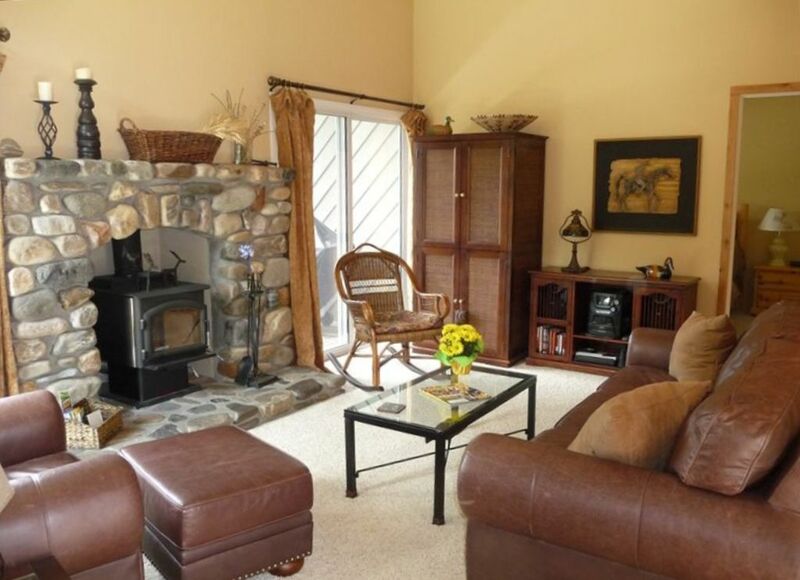 Close proximity to the ski resort via the path, which was steps away from the unit. The jacuzzi was also close to the unit and we enjoyed it after skiing. A short drive to restaurants, market, and shops. The unit itself was clean, cozy, comfortable, and well stocked. Water pressure in the shower was great, beds comfortable, and kitchen very well equipped. Wood fire place with wood provided a nice plus, as well as shampoo, lotion, laundry detergent available for use. We enjoyed our five nights and would definitely stay here again. short walk to to the ski area. The condo was perfectly clean, comfortable and cozy. The kitchen was well equipped and the bathrooms even had shampoo and body wash. It was close to the lifts via the bike path and about 1/2 mile walk into town. Loved it!! Great place. Very clean and updated. Kitchen had every thing need to cook if you wish to do so. Thank you for the kind words and so happy you enjoyed yourself. You are welcome anytime.